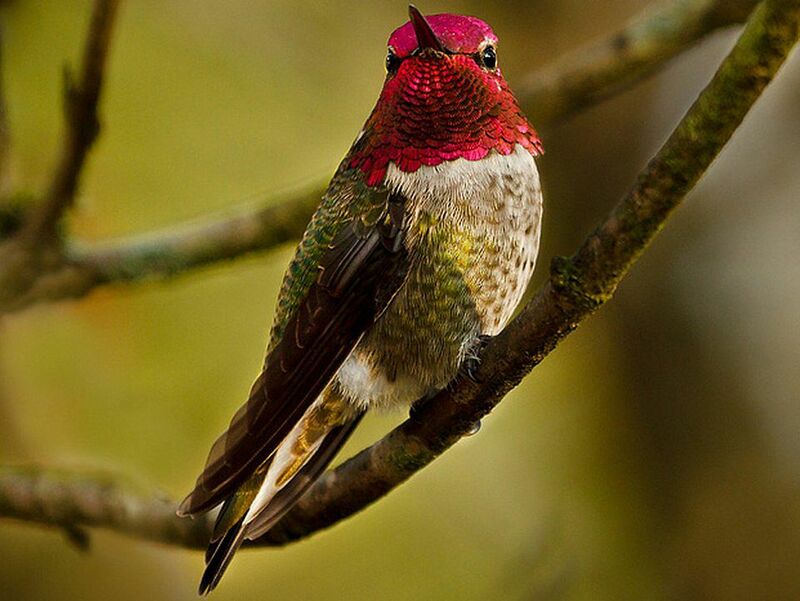 Boldly colored and perky, the Anna’s hummingbird is a year-round star of the western hummingbird species. This is one of few hummingbirds to stay in most of its range throughout the year, and in doing so it brings a touch of color and personality to birders’ backyards in every season. Markings: Dimorphic species. Males have an iridescent pinkish red head, throat and neck that may appear black or reddish orange depending on the light. The chest, abdomen and sides are gray with a green tint. Wings and tail are dark dusky black and there is a pale eye ring. Females have a green crown, back and tail, any of which may show some minor iridescence. The chest, throat and abdomen are pale gray, and the pale gray throat has central dark red spots or splotches. The wings and tail are dark and there are white spots on the outer tail feathers. Females have a white patch over the eye. Species is monotypic. Juveniles are similar to females and will gradually develop their adult plumage. Anna’s hummingbirds can be found along the Pacific coast from central Baja to southern British Columbia, as well as in southern Arizona and extreme southwestern New Mexico. They prefer open woodland and scrubby riparian habitats, though they are well adapted to urban and suburban parks and gardens, particularly where hummingbird feeders are available. Extreme northern and southern populations may migrate, but most of the birds remain in their territory throughout the year. Occasional but rare records of winter Anna's hummingbirds have been noted in eastern Texas and western Louisiana. Like most hummingbird species, Anna’s hummingbirds are not extremely vocal. They will make a very high pitched, raspy buzz as well as “chip” and “pip” notes when perched or while chasing intruders, and their sounds and songs can be heard year-round. While singing, male Anna's hummingbirds often perch high on twigs or wires and will droop their wings slightly. Anna’s hummingbirds are the carnivores of hummingbirds, and while they do feast on nectar they typically eat more insects and spiders than most other hummingbird species, even to the point of perching near spider webs to pluck off trapped insects. They are solitary but abundant birds, and the fact that they usually hold their tail still while hovering can be a key to their identification. Male Anna's hummingbirds perform spectacular courtship display dives from 130 feet in the air, swooping to the ground in front of females and creating a buzz through their tail feathers at the bottom of their dive. These hummingbirds are polygamous and most of the nesting and rearing of young birds is up to the female. She will incubate a brood of 2 plain white eggs for 15 to 19 days and then care for the altricial young birds for 18 to 22 days until they leave the nest. Anna’s hummingbirds may raise 2 to 3 broods per year, starting as early as late October or early November in the southernmost part of their range, and the breeding season continues through June. Anna's hummingbirds have been recorded as hybridizing with several other hummingbird species, including black-chinned hummingbirds, Costa's hummingbirds and Allen's hummingbirds where the different species' breeding ranges overlap. Anna’s hummingbirds are easily attracted to backyards where they can find nectar flowers and hummingbird feeders. Because these birds eat a large quantity of insects, birders should avoid using insect traps, pesticides or insecticides that would minimize that food source, and spider webs should be left intact for Anna's hummingbirds to glean. Anna's hummingbirds are not considered endangered or threatened, but they are susceptible to different threats, such as habitat loss, feral cats and window collisions. In the northern parts of their range, harsh winter weather can be problematic, but backyard birders who take steps to keep hummingbird nectar from freezing can help provide a reliable food source for overwintering birds.